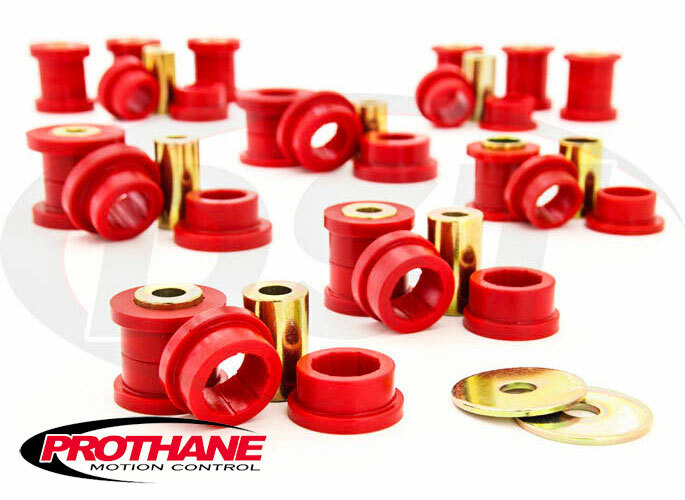 Polyurethane Rear Control Arm Bushings from Prothane are a durable aftermarket replacement for the original upper and lower control arm bushings that last longer and hold wheel alignment. Find the Rear, Upper and Lower Control Arm Bushings for your vehicle below. The original bushings that connect your rear control arms to the frame are made of rubber which is great at absorbing vibration from the road, but over time will fall short when it comes to keeping your rear wheels in alignment. This can cause scrubbing or uneven tire wear along the outer edge of the tire, leading to early replacements. In extreme cases the camber angle of the tire can shift dramatically during a hard, quick turn causing a loss of traction from the rear wheels. This can be troublesome if you're trying to hug the inside lane at Cresson Motorsport Ranch or avoiding wildlife on the highway at night. Prothane's polyurethane control arm bushings hold their shape much better than rubber when under the pressures of driving over time, whether it's a daily commute or a time attack at the local track. Besides providing more stable wheel alignment these bushings also stand up to road salts, grime, and other degrading elements better than rubber. Stiffer bushings can transfer more road feel (vibration) to the driver, but you will notice much sharper handling from your vehicle especially during a turn. Made in the USA, these bushings are covered by a Lifetime Warranty and excellent customer service. Rear Control Arm Bushings - I.R.S.